The Shipshewana Flea Market is one of the largest flea market in the Midwest. With a hundred acres full of venders. It is held every Tuesday and Wednesday through May to October. The flea market sells stuff from fresh vegetables and fruit to hand crafted art and furniture. They also sell fresh Amish cookies, pies, pretzels, and ice cream. They have hundreds of stands and each and every one sells something different. They also sell parts for cars, pocket knives, and other stuff that are at a good, reasonable prices. One of our favorite stands there is a place called C&J’s dips. They sell dips from appetizers to desserts. But, just a year ago they came up with soups. The dips are really easy to make and almost anyone could do it. The other places that sell dips look good, but once you buy you feel bad that you wasted your money there and not at C&J’s. When my family goes we get to spend about ten dollars each. So one of my things that I got was a nice pocket knife; I thought it was going to expensive, but it actually only ended up costing three dollars. So I would recommend going sometime to the Shipshewana Flea Market and spend some money there. Just be warned it is hot and there are a bunch of people there too. The Shipshewana Flea Market is one of the biggest flea markets in the Midwest. A flea market is a place where stuff is sold at low costs. It is like an outside mall. The stores are separate booths and tents set up to sell different things. They sell food, clothes, music stuff, junk, a lot of toys, and a lot more. I like to buy that you would not always find in other stores. I like to buy pocket knives, hats, and interesting stuff. Today I saw squirt guns that shoot water everywhere. There was also an IPOD speaker that could be attached to anything and play music. They have produce there to buy. The best thing to get to eat are Ben’s pretzels. They are made by Ben’s Bakery. They make them there at their booth. The dough they use is good. They also have a lot of butter and salt on them. Another good place to get food is the Ben’s Bakery booth. We always get cookies there. The molasses cookies and the monster cookies are really good. There are over 900 vendors there. Every year there are over a half million visitors there. The Shipshewana Flea Market is fun to go, even if you don’t buy anything. But, I recommend you buy a few things! The Shipshewana Flea Market has a ton of things to buy. I like to look at everything there before I buy anything. My mom bought me a fake hair ponytail. It is a long, straight ponytail that clips onto my real hair. I bought a Webkinz Schnoodle. It is a half poodle, half schnauzer stuffed animal. I also got an American Girl doll dress. It is orange and sparkly. There is a booth where a lady makes doll clothes and sells them. I had to think which dress to pick – it was really hard. There were a ton of dresses to choose from. I had $10.00 to spend. We went to Ben’s Bakery. We bought cookies and a pecan pie. We went to the soft pretzel stand. We bought extra pretzels. My mom dropped one on the ground, but my brother still ate it! They would eat anything! We had to buy things for my grandma – calendars, scrubbies, and cookies. We saw many Amish people. They were at the flea market. Afterwards we were going to pick berries, but they had already been picked. We ate lunch at the Blue Gate Restaurant (that will be in a later post). You should go there, it is really fun. 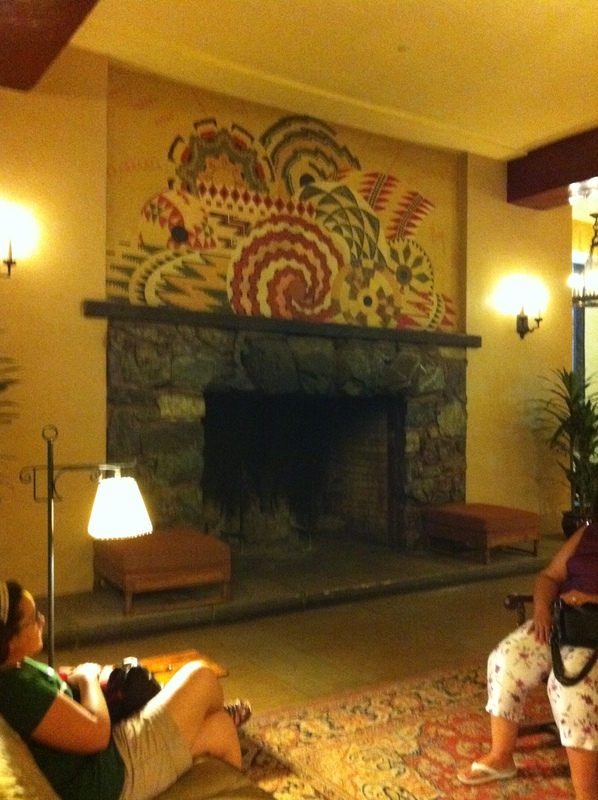 The Ahwahnee Buffet is located in a lodge/hotel in the Yosemite. The hotel is almost 100 years old and is still working. The buffet that we went to was for fathers day. The buffet was during brunch. They had many diffrent foods to eat like fish and shrimp to omletes and cresonts. The buffet has two stations where you get to make and pick the type of food you want. One of the station is and omlete station where you get to pick the type of omlet you want. The othere station is where you get to pick the type of meat you want and the cut it fresh right there. The buffet is expensive with prices that are fifty dollars for adults and twenty five for kids. but the buffet is worth the price. So if you don’t mind paying then you should really try to go. 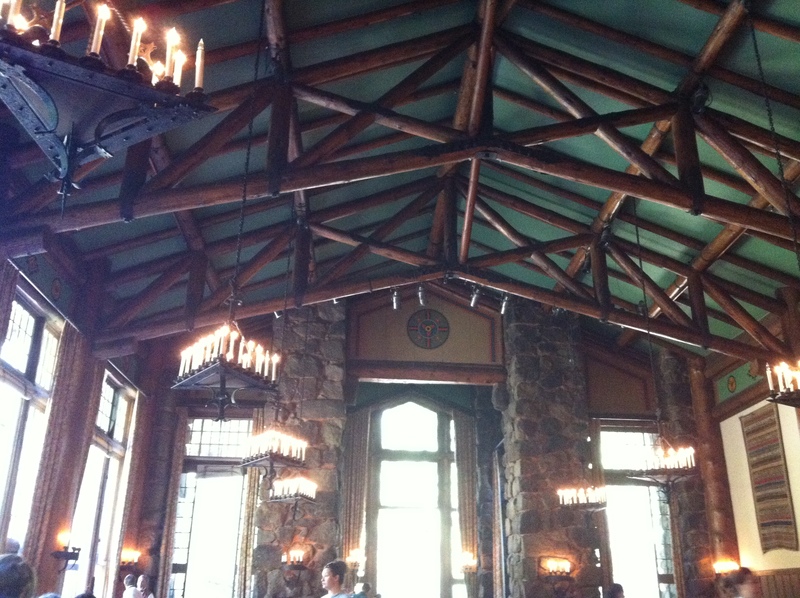 The Ahwahnee Buffet is in a lodge/hotel that is almost 100 years old and is still in business. When you get to Yosemite it is located in the valley. You want to make sure that you make reservations becuase the place will get very packed. You will also have bring your money because it is almost 40 dollars a person for the Sunday buffet. The food there though is definitely worth the money. They have a omelet station that you can pick from toppings to put in your omelet. When you go, you want the brunch meal not just breakfast. At the brunch there is more than just breakfast you can get shrimp and a lot more lunch stuff. Plus if you want breakfast stuff, then you can get that too. Those are the reasons we went to the Ahwahnee Buffet. The Ahwahnee Lodge is in Yosemite National Park. We did not stay there. We just ate breakfast there. The Lodge is beautiful. It has a ton of fireplaces and is really old. They served hot chocolate and coffee in the lobby – near the restroom. I went to the bathroom twice just to get more hot chocolate. They had a big ice sculpture at the buffet. First in the buffet, you could make an omelet with all of your favorite foods. Then, there was a butcher. He would cut off meat for you to eat. I did not like the roast beef, but the ham was really good. Then there were fresh foods, veggies, shrimp, oysters, probably everything you could ever ask for. It was all good. Biscuits, gravy, and eggs were on another table. Cereal and desserts were on other tables. The service was good, we had a nice waitress. You should try to eat there. Tenaya Lodge is a hotel that is just outside Yosemite National park. Tenya Lodge has regular hotel rooms, and they also have cottages in a different location next to the hotel. The cottages have three apartments in each building. The cottages are a little bit more expensive then the regular hotel rooms. 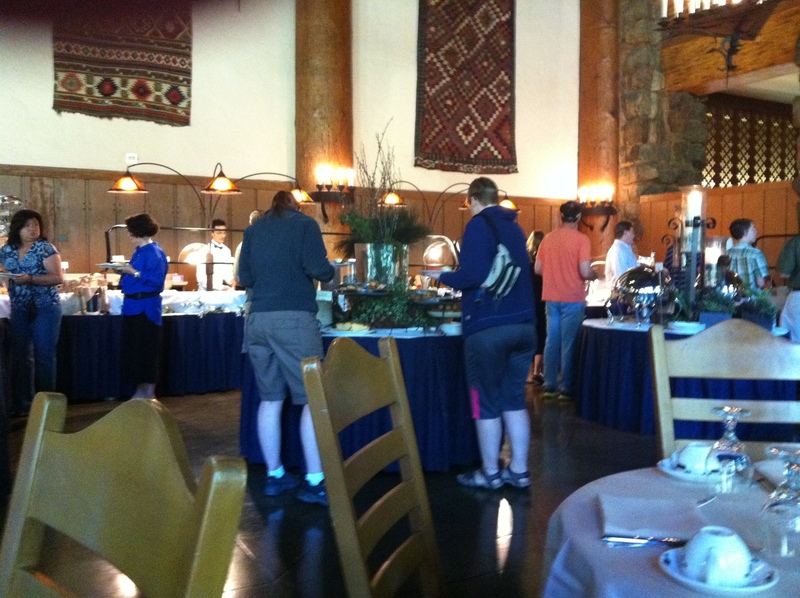 Tenaya Lodge has two restaurants in the main hotel. The first one is called Jackalopes – it’s a place that sells burgers and fish and chips. They also have a restaurant called Embers, but it is really expensive from food that cost ten dollars to food that cost forty-two dollars. They have three pools and one splash pad. One of the pools is in the cottage area so only people who stay at the cottages can swim there. The pool at the cottage area is smaller than the others and the walk over to the hotel is worth it. The outdoor pool they have is connected to the splash pad. The pool is outside and has many toys like foam balls and noodles. The splash pad has sprinklers and water shooters. The splash pad is more for little kids than older kids. The indoor pool has toys like footballs and frisbees. There are also three hot tubs – one in the outdoor pool and two in the indoor pool. If you don’t mind paying a little bit more than you should really try to stay in the cottage area, but the hotel rooms are good too. So, if you are in the area then you really should try to stay there. Tenaya Lodge is a hotel that is just outside Yosemite National Park. Tenaya Lodge has a lot of rooms for guests, but there are different rooms you can stay in. One is a house that is cut into three. That has the most room, and that is what we stayed in. It was really nice. Also there they have 2 restaurants. One is for adults and one for families; the food at the family restaurant has pretty good food, so I would eat there because there are not a lot of restaurants in the area. Also if you go in the summer or winter they have a pool – one indoor and one outdoors. There are hot tubs indoors and outdoors too. If you stay near the cottages then they have a restaurant there. It is a pizzeria. Tenaya Lodge is definitely worth the stay. Tenaya Lodge has a ton of cottages. Every cottage has three rooms in it. The rooms are have a separate bedroom and bathroom from a living room. In the cottages, one room is on the second floor up high. The rooms are nice and big. The rooms are clean and have a fireplace. They have a pool outdoors and indoors. The outdoor pool is a zero entry pool. If babies go in the pool they can stand in the zero entry water. The pool is nice because they have toys in it to play with. There is also music playing for you to listen to while you swim. The indoor pool has two hot tubs with it. One is for adults and one is for everybody. We even snuck into the adult hot tub – no one else was in it. They have pool toys inside too. There are noodles and footballs. It is a good place, and I would stay there again. Chinatown located in San Francisco is the largest Chinatown in the United States. It is the oldest Chinatown in America too. Chinatown is 1 mile long by 1.34 miles wide. Chinatown was founded in 1848. In 2000 the census said that an average of 100,574 people lived in Chinatown. Chinatown is a city within a city. The town has over 300 restaurants and just as many shops. One of the places we ate at was a dim sum restaurant. It was called City View Dim Sum. (We will be doing another blog on City View – so watch for it!) Chinatown compared to other places is really huge with an area of 24 square blocks. My family and I tried to walk all around all it, but we didn’t get done in the amount of time we had. We went into one of the shops located there. It was three stories tall and had over one thousand trinkets and gizmos. Chinatown is a fun place to visit and to walk around. Chinatown in San Fransisco is the biggest Chinatown in the world except China. In Chinatown the best place to eat is a Dim Sum restaurant. There are dozens to choose from. When we were there, we walked around in a bunch of stores. The one we went in is three stories tall with stuff. You can also buy clothes from China. They also have a bunch of restaurants that have unique and interesting food. I recommend going for a long time to see every thing and be prepared to spend a lot because there are a lot of fun things to buy. Chinatown is definitely worth going to if you are in San Fransisco.